There may not be a single character more directly affected by the outcome of Marvel's recent Siege event than Bucky Barnes, formerly known as The Winter Soldier and today donning the legendary guise of Captain America. When Steve Rogers made his unsurprising return from a year-long dirt nap last winter, I had some concerns over where Bucky would fit in the pecking order. Now, with Steve firmly entrenched in his role as the head of U.S. security, his shield (and the focus of this series) has been passed officially to Barnes. In a lot of ways, that feels like the impetus for a fresh new start. Even though Bucky's been at the center of this series since Steve's "death" three years ago, there's always been a prevailing sense that he merely had the spotlight on lease until the original Cap strode back into the picture. Now, with the identity of the star-spangled Avenger decided - at least for the short term - longtime writer Ed Brubaker has turned his focus on the stark differences between Steve's take on Cap and Bucky's. It's a very liberating time for the series, which is beginning to move past the half-century of continuity that had been burdening it at the start of Brubaker's run. Where the audience knew just about everything worth knowing about Steve Rogers, the current mantle-bearer carries a slate that's much less decorated. The first step in Bru's process of etching that stone is introducing a new major foil for the series, which ultimately takes the shape of Baron Zemo. The Baron isn't exactly unfamiliar with Captain America, nor with Bucky himself, but it's been quite a while since he's been directly involved with either. 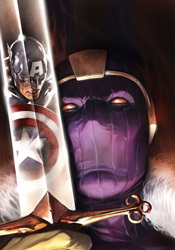 Now, with the Red Skull momentarily out of the picture, the stage is set for something different, and as first challenges go, Zemo's a great place for Bucky to start. In Brubaker's hands, he has the potential to become a major player once again, and the issue ends with the message that the ride is just getting started. Butch Guice's artwork is the latest in a series of great matches for the series. Like Daredevil when Brian Michael Bendis (and later Brubaker himself) were at the helm, Captain America has enjoyed a remarkably consistent art style despite a routinely shifting creative team. Both have employed a shadowy, gritty look and feel that isn't particularly detailed, but also isn't excessively streamlined and simplistic. Guice shakes things up a bit with a series of clever, unusually organized pages that take their hints from Jim Steranko's brief work with the character. In many instances that makes for a direct homage to the famed artist, although it also occasionally results in some difficulties navigating the action. In addition, there's a real disconnect this month between the panels set in near-darkness and those in direct sunlight. In the dark, Guice's style is sleek, restrained and captivating. In bright light, his work feels more dated, clunky and awkward. Fortunately, the bulk of this issue takes place after midnight. Captain America hasn't felt this wide open in my lifetime. With his mentor occupied elsewhere and the looming threat of the original marquee player reclaiming this series finally off his back, Bucky's chance to run with the ball has officially arrived. There's enough potential for change to appeal to new readers, but enough reverence for previous tales and the long, storied history of these characters to keep old-school fanboys happy as well. As long as Ed Brubaker sticks around, this series is in a great place. Buy it.